Federal tax return involves many parameters, such as filing status, tax calculation scheme, sources of income, payment of estimated taxes, and computations and for some filers can get very complex. Federal tax return is centered around form 1040, also called U.S. Individual Income Tax Return. This form provides sections for identification of the taxpayer, filing status, income, expenses, deductions, taxes and credits. The very first section on form 1040 is used for tax payer's identification, filing status and determining of exemptions. In case you need to change your address on your federal tax return, you can use Form 8822, Change of Address (see here for more information IRS address change). The next section on form 1040 is used to determine income and its adjustments. Information can be pulled into this section from various tax return schedules (see a list below). The last line on page one of the federal tax return 1040 form provides information about so called adjusted gross income. Adjusted gross income is referenced later in state tax returns when you complete your state taxes. The second page of form 1040, individual federal tax return, is used for calculating tax and credits. In addition to these most common federal tax return schedules, IRS provides many other schedules to cover other special situations and circumstances, such as Schedule L Standard Deduction for Certain Filers, form 6251 Alternative Minimum Tax for Individuals, and form 8829 Expenses for Business Use of Your Home. Forms for federal tax return schedules are available for free as fillable PDF documents and can be downloaded from the IRS web site. It is recommended to not use forms from any private web site. Checking your federal tax return status is a one-page process which requires knowing your SSN, filing status, and your expected federal tax return refund amount. After you click the "submit" button, you get your federal tax return status online instantly. When calculating your federal tax liability, you can run into several tax calculation schemes. If your situation is simple, you will most likely end up calculating your tax liability using regular tax tables that are applied to your adjusted gross income after deductions and exemptions (see tax calculator). In case a portion of your income is a capital gain, you will be a subject to capital gain tax rate. In this case, you will end up calculating your income using the "Qualified Dividends and Capital Gain Tax Worksheet" (see form 1040 instructions, around page 39) or using the "Schedule D Tax Worksheet" (see schedule D instructions, page D-10). If you are running your own business, you will likely pay some self employment tax, which you calculate on page 1 of Schedule SE of your federal tax return. If you make a certain amount of income but your tax is too low, you might be required to pay alternative minimum tax which is calculated on form 6251 Alternative Minimum Tax for Individuals and then reported on page 2 of your federal tax return. Most federal tax return filers go by the calendar year tax period. In this case, federal tax return must be filed by midnight of April 15th. It case you are a U.S. citizen or resident, you can request a 6 (4 if "out of the country") month extension to file your federal tax return. To ask for an extension, file form 4868, Application for Automatic Extension of Time To File U.S. Individual Income Tax Return. This form must be filed by the regular due date of your federal tax return. Tax is payable on the same date when the federal tax return is due, which is midnight of April 15th. If you fail to pay your taxes by this date, you will owe interest on any tax not paid by the regular due date of your federal tax return. In addition to that, you may also owe late payment penalty which is usually 1/2 of 1% of any tax not paid by the regular due date. Late payment penalty is charged for each month or part of a month the tax is unpaid, and the maximum penalty is 25%. Many users found that e-filing is a convenient way to file their federal tax return. It saves time, money (it is free), it does not get lost in the mail. Filers making $57,000 or less a year may even qualify to use free tax preparation software and electronic filing through so called Free File program (http://www.irs.gov/efile/). If you prefer the old fashioned way, federal tax return can be mailed by regular post to the IRS office serving your tax district. You can find your federal tax return mail-to address on the last page of federal tax return form 1040 instructions. Before you file your federal tax return, it is wise to double check several points on it for validity and correctness. Having typos or missing information on your federal tax return increases your chances of being selected for a review. See tax return check list (checklist for an error-free tax return). When assembling your federal tax return, all the paperwork needs to follow a certain order. 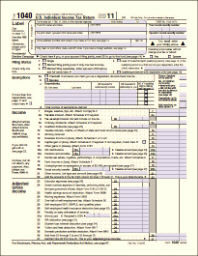 Any schedules and forms need to be assembled behind the federal tax return form 1040. Forms should be assembled in the order of the "Attachment Sequence No." shown in the upper right corner of the schedule or form. Forms W-2, W-2c, 2439, and W-2G should be attached to the front of the federal tax return form 1040. The very first attachment of your federal tax return should be your check (in case you are sending one). Forms 1099 do not usually need to be attached to your federal tax return, unless tax has been withheld. Attachments should not be stapled to the federal tax return. They should be attached using a paper clip instead. Stapling attachments to the federal tax return will delay the processing of it and any refund. and qualifying widow(er) with dependent child. If you qualify for more than one filing status, you may choose the most advantageous federal tax return status. Taxpayers are required to withhold at least 90% of the tax burden for the year. Make sure you withhold enough to avoid penalties. Never rely on any private website to calculate your final tax. For your own safety, please, always refer to IRS published instructions. Always check with your accountant or tax advisor regarding your personal situation.